Tashkent is one of the ancient cities in Uzbekistan . The great Silk Road used to stretch across this land, which enabled to establish economic and culture ties with other countries. The monuments of past that have been preserved still reflect an art and building culture of different epochs. Ming Uryuk, Ak-Tepa, Khanabad and other archaeological monuments are still indicative of the developed city building culture in Middle Ages. Arabs have brought in some innovations with them. On the territory presently occupied by Tashkent , in AD 9-10 the city-type vocational villages (Kukcha, Kallyakhana, Tankho-Shakar and others ) have been formed. In AD 13 Chingiz-khan troops destroyed the city and later during the Amir Temur's rule the city was rebuilt. The city was surrounded with a wall. In a suburb area - rabad - the memorial complexes Hazret Imam, Zainaddin Kui Arifoni, Sheikhantaur and others have been erected. Some of them have been preserved to the present days. In AD 16 on the border of Shakhristan, Kukeldash madrasah has been built. The city consisted of four parts named "dakha": Sheikhantaur, Kukcha, Sibzar and Beshagach dakhas. Neighboring states and nomads have been repeatedly attacking Tashkent up to the AD 19, though the city managed to survive again and again. In 1930 Tashkent has become the capital of Uzbekistan . This is a large political and culture center of the Republic. In 1991 Uzbekistan proclaimed its independence. During the recent years noticeable changes in a building culture have taken place in the capital. The number of sport and public facities was erected. Among them - tennis court, "Djar" sport complex, "Intercontinental" Hotel, Oliy Majlis (Parliament) building and many others. The population of the city keeps growing every year. Correspondingly does Tashkent itself, which is giving an example and rhythm to other cities in Uzbekistan . 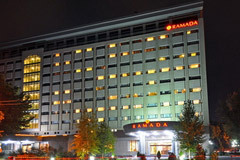 Grand Mir Hotel in Tashkent - Luxury hotel with attractive interned deals. Rovshan Tashkent - One of the the first budget hotels built with aim to foreign tourists. 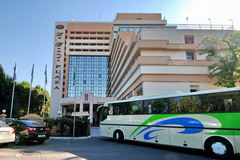 Malika Tashkent - Review and make online reservation of budget hotel in Tashkent.